According to a recent report from Barnburner's No Holds Barred Podcast (courtesy of Ringside News), former two-time WWE Champion, AJ Styles is reportedly set to face a WWE veteran at next year's WrestleMania 35 in the Metlife Stadium. Prior to this year's Survivor Series pay-per-view, where AJ Styles was seemingly set to face Universal Champion, Brock Lesnar in a mega rematch, 'The Phenomenal One' lost his WWE Championship in shocking fashion to Daniel Bryan, who ended a legendary reign that lasted well over one year. Styles since then has earned himself a rematch at the upcoming TLC show and will look forward to regaining the WWE Championship from Bryan, who over the past few weeks has developed a much more ruthless attitude. 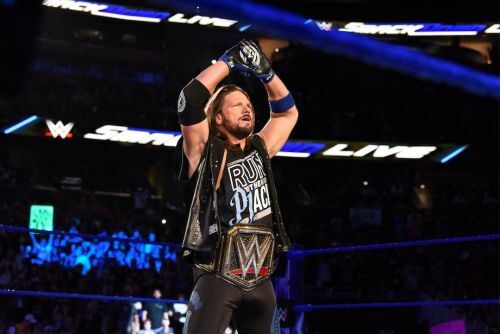 Since the brand split in 2016, AJ Styles has been at the top of his game on SmackDown Live and the blue brand is indeed 'The House That AJ Styles Built'. Styles has almost been engaged in blood intense feuds against some of SmackDown Live's top stars, in the form of Samoa Joe, John Cena, Shinsuke Nakamura, Shane McMahon, and several other notable names on SmackDown Live. However, one name against whom 'The Phenomenal One' is yet to work in a long-term program with is non-other than former multi-time WWE Champion, Randy Orton. Both Orton and Styles have definitely shared the ring with each other in the past on SD Live but it now looks like both men could be in for a long-term feud against each other on the blue brand heading into WrestleMania 35. As per Barnburner's No Holds Barred Podcast, Styles and Orton will be locking horns with each other on the big stage, that is, WrestleMania 35 and despite the match being billed a bit unusual for both men, fans could be in for a real treat with this one. WrestleMania 35 is set to take place on the 7th of April, 2019 at the Metlife Stadium in East Rutherford in New Jersey, however, we are still several months away from WWE's annual biggest show of the year. And, as of right now, the major focus in the upcoming TLC PPV which takes place on the 16th of December.